Ah, yes, the to-do list before jetting off on your next trip can seem very daunting. However, for many years I've found that the anticipation before going on an exciting journey... that buzzy, flighty feeling that comes in between when you book your flights and touching down on foreign soil was something to savor. That sweet spot in between checking off the necessities and the day before takeoff is GOLD to me. It's during this time that I find myself longing to amplify my excitement and knowledge about our next big adventure. Does anybody else do this? It cracks me up when Luke tells me that before he studied abroad in Rome, he never even knew what the city looked like! Like... what?! I'm a big advocate for entering foreign places with a sense of curiosity, but man... not that much! Having some previous knowledge about the rich history, cultural and culinary traditions is an excellent way to connect with locals, and also approach our adventures with a sense of humility and appreciation. Not to mention, sometimes, the best part about getting ready for your trip is getting oh so excited for it. Here are eight simple ways to build your anticipation a little more and boost your knowledge along the way before you hop on that big jet plane! Nothing gets me quite in the mood for adventure than watching a movie set in a foreign place. Seeing the streets of London set in the Victorian age, or the jungles of Thailand, or the trials and tribulations of the American West through a compelling storyline brings out the best of my wanderlust. I'm partial to turning on "Midnight In Paris" and "Roman Holiday" when I'm feeling nostalgic! Hearing the dialect, getting swept up in dreamy settings, seeing the manner of dress and cultural expectations gives you a bit of insight on how your adventures might pan out. And not only do you get to see the nuances of the location, but you might also get to learn a thing or two about the history and culture. Choose a movie set in your destination, or research some that are considered to be "classics." A quick Google search will bring up lots of recommendations! There's something about reading a great book set in a fantastic setting that brings us closer to the heart of the history and culture of where we're about to jet off to. Just try to not feel excited about a trip to the English countryside after reading Pride & Prejudice! The same goes for Dracula and Romania, The Good Earth and China, On The Road and the American West... and so much more. Do some research and look up classic literature set in your next destination. Nothing will make you feel more swept away and buzzing with excitement! Visiting a museum or watching a historical documentary might not seem like a must-do before you set off on an adventure abroad, but doing so certainly ensures that you can enter your destination more informed and with a sense of respect and admiration. Although it's impossible to learn everything about the nuances and intricacies of a place's history, taking an hour or two to gain some insight goes a long way. I loved learning all about Japanese history through quick Youtube videos before our trip a few years ago. I now find myself looking through historical books and documentaries on my next destination because it simply deepens my relationship and understanding to the area and its people! This one is the ultimate. Connect with a local, either in person or online. Ask, ask, ask. Hear their stories. Hear their recommendations. Hear the thrill in their voice as they explain something unique or not-to-be-missed. Guaranteed excitement overload! The best way to save information is either through Pinterest (check out my Travel board, if you're curious!) or through saving geotagged locations on Instagram with their "save" feature. Anytime I see a gorgeous photo, I take a second and save it for future use. That way, when it comes time to planning a trip, I have a plethora of locations, hotels, restaurants and images to get inspired from. I can't tell you how often I find myself referring to this list when it comes time to plan a trip. Don't forget to follow as many 'grammers that focus on your destination of choice! A quick search (either under the related Instagrammer channels tab or by searching through geotagged locations themselves) should come up with a ton of people to follow. You know what they said, there's no harm in asking! You never know what someone in your own community has to offer up. I like to ask for recommendations on Facebook to my friends, throw a question on Instagram stories for any followers to share insight, as well as ask questions on private groups I'm a part of (like Girls Love Travel). I'm always pleasantly surprised at the responses! The way to girl's heart is through her stomach. And the same goes for girls who travel. Perhaps there is no more intimate way to learn more about a place than through experiencing the act of cooking its food. Getting our hands dirty and deep into the ritualized steps of making traditional meals. Smelling the aromas of each ingredient combining step by step. The joy of making things together. Taste testing. Savoring each bite. It brings us closer to far away places. So, look up a traditional meal and get busy in the kitchen! Stocking up on music is my favorite way to get swept up in the romance of a place. Discover some of the top hits and classics of a destination is a double whammy. You get hours of entertainment to enjoy on the plane, on public transportation, while getting dressed, etc. while also getting a dose of culture. Win-win, right? 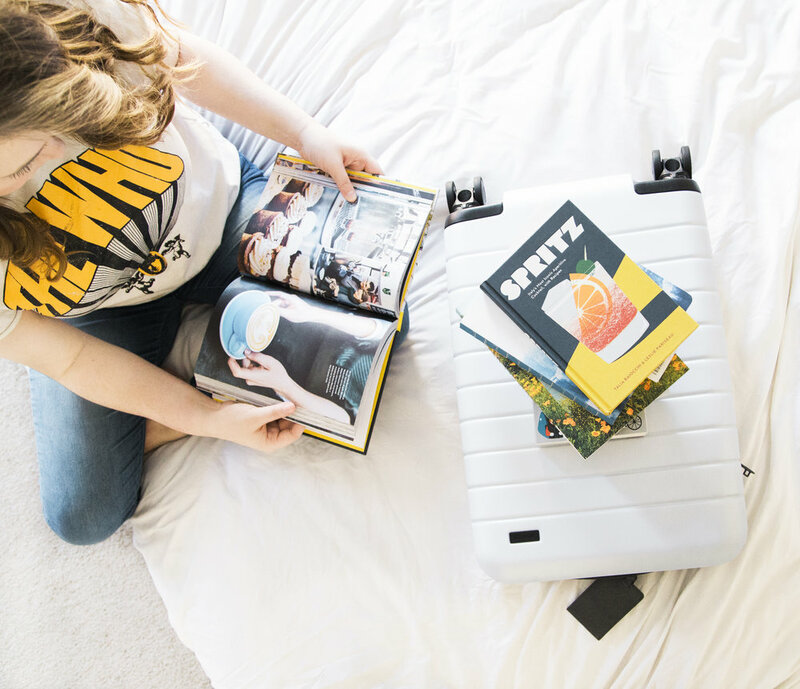 When it comes time to make your next "to-do" list before jetting off on a big, bold adventure... don't forget to add some of these ideas to it! You'll be gaining some excellent background history to feel even closer to the countries you're visiting AND getting yourself even more amped for the big day you hop on a plane! What are some ways you get yourself excited for your adventures?